The White House revealed a proposal to extend legal status and a path for citizenship for 1.8 million illegal immigrants brought to the country as children in exchange for $25 billion in funding for the wall, an end to chain migration across the board, and an end to the visa lottery program. The bill’s framework would apply to the roughly 690,000 illegal immigrants who registered for the DACA program started by former President Barack Obama as well as illegal immigrants who did not apply. A senior administration official told reporters that the 1.8 million number would be restricted by minor adjustments to timeframes and dates of entry issues. The path to citizenship would require a 10-12 year period where recipients would be required to demonstrate good behavior, work and education requirements, and good moral character. A senior White House official described the plan as an “extraordinarily generous concession” with Democrats but made several demands considered non-starters by members of Congress supporting amnesty. The White House said that it intended to send the framework to Senate Majority Mitch McConnell, who promised Democrats a vote on the Senate floor by February 8. The framework includes a $25 billion lump sum “trust fund” for a border security “wall system” for not only the Southern border but major security investments on the Northern border as well. It also includes sweeping limitations for chain migration — limiting family immigration sponsorships to only spouses and minor children — not for parents or extended family members. The new migration limitations would apply to all immigrants in the United States, not just the newly legalized 1.8 million. 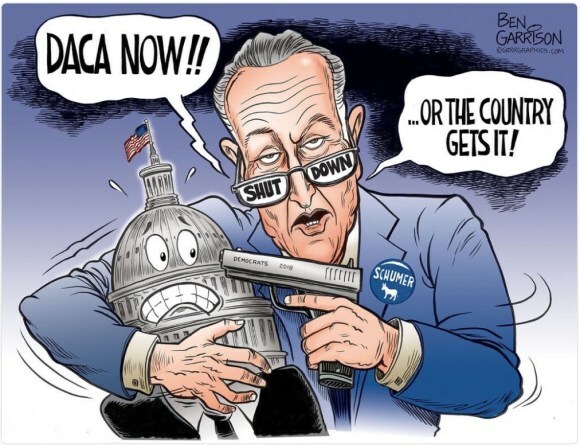 The bill framework was described as an effort to show exactly what the president wanted in a bill after open borders advocates complained that they had no idea where the president stood in their negotiations. The proposal would also end the visa lottery program and reallocate them towards fulfilling the skills-based visa backlog. The official noted that the current legislation was “galaxies apart” from what Senate Minority Leader Chuck Schumer discussed with Trump over lunch before the government shutdown, but felt that it was a plan that could get 60 votes in the Senate. 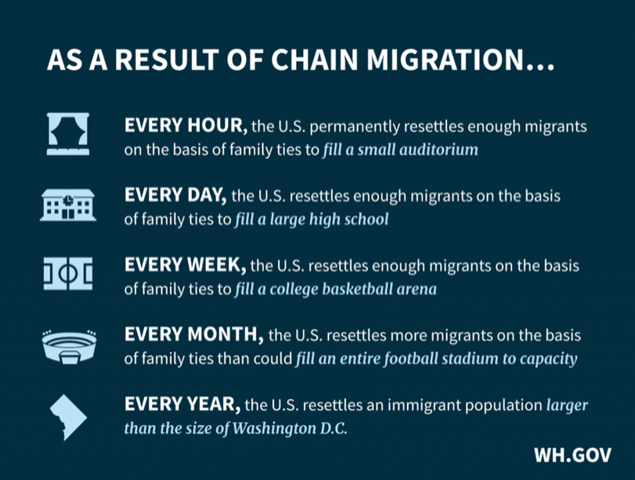 To understand the scale of the challenge that Chain Migration poses to those in charge of our nation’s checks and screening processes, it is worth providing some numerical context. President Trump has repeatedly stated that Congress must end Chain Migration as part of any legislative deal on DACA. Under our current Chain Migration system, newcomers are admitted to the United States based on family ties and distant relations, as opposed to a merit-based system that selects newcomers based on economic and national security criteria. The large influx of predominantly low-skilled migrants has had substantial fiscal and national security consequences. 10-12 year path to citizenship, with requirements for work, education and good moral character.